Click here to read guest blogger Deirdre's first installment, on destinations. Ship and itinerary go hand and hand and it’s a marriage in which one is linked inextricably to the other. If it weren’t, we’d all be content to sail bare-bones freighters to exotic ports or to board luxurious ships on cruises to nowhere. There’s no need for that, not when you have the stately Azamara Journey to give you both. We visited exciting and memorable ports, all the while sailing in comfortable and gracious style. A win/win, in my books! A view from the balcony you will never get on a land vacation! Ready to sit, drink, eat and relax at the Sunset Bar. I’ve been on ships where I couldn’t tell the Captain from Adam and where the Cruise Director was too lofty and busy to speak to passengers. I’m glad that’s not part of the Azamara culture. There’s an extra sense of well-being that comes from seeing officers and crew around the ship on a daily basis. You get to know them; they get to know you. You’re both invested in making the cruise experience a happy one. Tony Markey, Journey’s Cruise Director on this voyage, serving up a mean dish of gelato! Let’s talk food. It matters. I love that I am well looked after on Azamara, but you have to feed me first. Hungry? There’s a theme buffet every night at Windows Café on Deck 10. Maybe French one night. Or Greek another. Our taste buds were given a trip around the world, made all the better by dining al fresco on the aft Sunset Bar. When we were in the mood for traditional cruise ship dining we headed to Discoveries. What can I say, but there were more than a few nights when I thought I could eat everything on the menu. I might have reined myself in on that one but I won’t say that I never ordered two appetizers or desserts at the same meal. Because I did. The afternoon of the Officers’ BBQ on the pool deck featured a whole roasted pig! I don’t know about you, but the last time I saw one of those was at a Chinese restaurant in NYC when I was a little girl. The shredded pork and ribs were tender and mouth-watering and there were plenty of other meats, salads, fruits and more to go with it. Ryzzard Gussman, Journey’s Hotel Director, serving BBQ with his crew! In the mood for live jazz? Then it’s the Jazz Brunch served on a sea day that should whet your whistle. Again, another feast! If there’s one thing that Azamara does exceedingly well, it’s putting on a good spread. I have two favorite experiences on an Azamara voyage: the AzAmazing Evening and the White Night party. 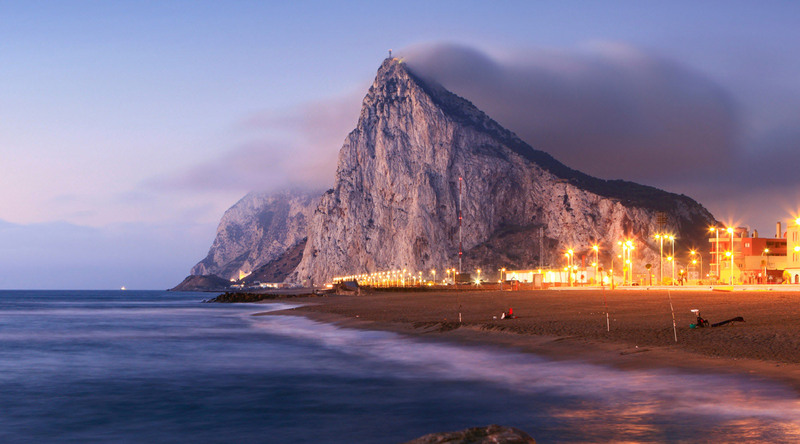 Take our last AzAmazing Evening on the Journey held in Gibraltar at St. Michael’s Cave. Can we say cooler than cool? Imagine being inside a large cavern bathed in atmospheric mood lighting while listening to the glorious sounds of the Gibraltar Sea Scouts Pipe Band. It was one of those “pinch me so I know it’s real” kind of experiences. And better yet, it didn’t end when the concert ended. Arriving back at the Journey there was a waiter greeting us with a welcome drink, an orchestra playing for our enjoyment on the Deck 5 promenade, and upstairs in Windows Café, freshly made soup and sandwiches. Ready to tuck in and call it a night after all this excitement? Hardly. There was dancing to the wee hours of the morning at the Looking Glass lounge brought to us courtesy of DJ Marcio, who knows how to get a crowd on their feet and have a good time. I loved the White Night party. We’ve been to lots of pool deck parties and this one is the granddaddy of them all. The best, the brightest, and the most fun, bar none. It starts with a buffet complete with festive decorations and elaborate food sculptures and arrangements. Waiters circulate among the guests offering wine, beer, and cocktails to the accompaniment of lively music and singing by the Journey orchestra and entertainers. The stage set, it’s not long before there’s lots of talking and laughing and dancing going on. It’s impossible not to smile at the buzz of excitement this outdoor evening generates. What can I say, but they know how to throw one heck of a party on board the Journey. Valencia made a beautiful backdrop for our fantastic White Night party. The sun sets but the party has just begun. Ah, so there you have it: our AzAmazing voyage onboard the Journey. I might give you the impression that in between the long days in ports all we did was eat and dance (no complaints there, of course!) but there really was so much more. Being on the Journey is about being on a ship small enough that you see the same people over and over again and you exchange pleasantries with them, and then you find yourself sitting with them and sharing a drink and conversation, and then you’re dining together, asking them when they’ll be back on Azamara because you’d really love sailing with them again. It’s about the many crew members who are genuinely happy that you are on the Journey with them and the officers who run a tiptop ship with ease and grace. It’s about going to a lecture if you want or listening to afternoon piano music or falling asleep on a deck chair. It’s about hospitality as only Azamara can deliver it. Thank you, Journey, you’re the best. See you next year! Deirdre and Rob Norton, from Indianapolis, sailed on the Azamara Journey Sept 3, 2014 from Lisbon to Barcelona. Avid travelers and cruisers, this is their third Azamara Club Cruise in 9 months. Deirdre's cruise review on Cruise Critic was so popular she was invited to be an ACC guest blogger. This is the second of two posts on their Mediterranean cruise.